Anni & Jasmin on GZSZ: What a Difference a Year Makes | Rosalie & Co.
A year ago, I introduced the international readers of this blog to Anni & Jasmin, two characters on the German soap opera Gute Zeiten, schlechte Zeiten (GZSZ) who had fallen for each other. Back then, the romance between the “dyke” and the “bimbo”, as they called each other teasingly, was still in an early stage and so was the fandom. Cue one year later. Anni & Jasmin, who officially became a couple last July, are still together, but have reached a critical point in their relationship as they’re trying to figure out how to deal with their very different wishes and needs. Their struggles are being watched not only by several million regular GZSZ viewers, but also by thousands of international fans. So it seemed like a good point to revisit the storyline and the fandom and comment on what has happened this past year. Hail to the cliché? Not this time! There are a few things regarding the Anni & Jasmin storyline and the fandom that have surprised me, but in a positive way. Having watched and written about lesbian storylines on German soap operas and telenovelas for years now, my expectations aren’t usually very high, especially when it comes to consistent storytelling and character development. My skepticism was increased when the character of Anni was introduced by TV channel RTL’s PR department as a “tough and tattooed lesbian” who would fall for one of the long-established female characters of the show – a straight one, of course. Stereotypes much? Luckily, Anni has turned out to be a much more complex character than the press release let on – self-confident and tough on the outside, yes, even feisty and stubborn at times, but also vulnerable and self-critical, especially when it comes to her music. Moreover, the writers have managed to avoid a lot of the pitfalls of telling a lesbian love story on TV. Yes, Jasmin was straight up until she fell in love with Anni, but there was no love triangle with her, her former husband Kurt and Anni and no lenghty coming out, “I don’t know how to tell my friends and family that I’m with a woman now” storyline. Unlike other shows, GZSZ also made a point adressing homophobia not just in the family – Anni’s father – but also in society. In the context of a storyline in which Anni, Jasmin and their friends protest against a businessman who had publicly made derogatory remarks about homosexuals, the show took up an actual discussion about equal rights and sexual diversity in Germany. The way they hammered it into their viewers’ heads that homophobia is wrong and diversity is okay might have seemed a little over the top to some, but after reading ignorant comments viewers have made about the Anni & Jasmin storyline, it made sense to me. So now, the characters seem to have reached a crossroads regarding their relationship. While Jasmin would love to spend time with her girlfriend 24/7, the freedom-loving Anni feels cramped and is wondering whether love is really enough to make a relationship work when the people in it are so different. What I like about this story arc is that their problems aren’t caused by one of them cheating. Moreover, their problems don’t have anything to do with them being a lesbian couple. It’s something that can happen to every couple, regardless of their sexual orientation: That, after the honeymoon period, you have to figure out how you can be together in the long run. But as much as I like that the writers have decided not to take the easy way out, they would be wise not to draw this out for too long, either. Because even the most loyal and patient fans will grow weary if they don’t see their favorite couple happy, at least for a while. And considering how the “JasAnni” fandom has managed to thrive, against all odds, that would be a shame. Up until last year, I was convinced that a lesbian storyline on a German TV show would only garner a significant international following if there was at least one of two things, better yet, both: Clips of the storyline on YouTube and coverage on international websites for lesbians, namely AfterEllen. 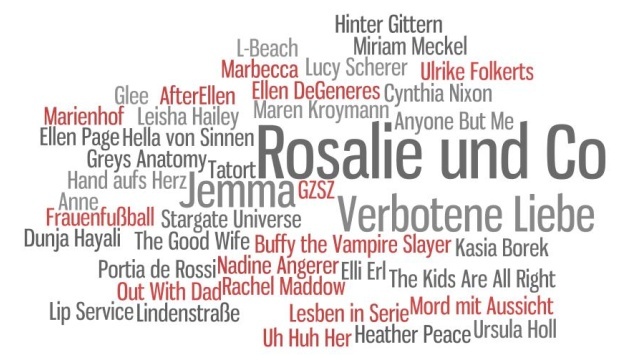 I think that the compilations of scenes with English subtitles that were posted on YouTube contributed largely to the rise of the “Marbecca” fandom, as did Heather Hogan’s Hand aufs Herz recaps on AfterEllen for the international “Jemma” hype. But if you looked for Jasmin & Anni on YouTube last summer, you could barely find any videos with them, let alone compilations of scenes. Content regarding the storyline that was posted on YouTube got deleted faster than you could even mutter “copyright infringement”. As for AfterEllen, they made a half-hearted attempt at covering the storyline last September, after much begging from the fans, but withdrew the article shortly after because of copyright issues. Since then, they seem to shy away from giving it another try. And yet, the international fandom is thriving, and it’s getting bigger every day. How do I know that? Well, let’s look at the numbers: There’s an international Anni & Jasmin Facebook group with more than 10,000 members and a Google+ group with more than 20,000 members. One of the few Anni & Jasmin videos still on YouTube has been viewed almost a million times in only 8 months. And the GZSZ content on this blog has garnered more than 100,000 page views altogether in only one year. As for the reasons for the fandom’s success, I think that it’s a combination of various aspects. As I’ve mentioned before, it’s a good storyline. The writers seem to care about the characters and to respect both them and the viewers. The actresses Linda Marlen Runge (“Anni”) and Janina Uhse (“Jasmin”) not only have great chemistry, which makes it fun to watch them together, but they also seem very dedicated to the storyline. Both of them are very active on social media and regularly share photos and videos, often of the two of them together. All of this contributes to the willingness of fans to dedicate time and effort to the fandom, to find a way to share the storyline so others can watch it, too, and become part of the fan community. Most fans probably met on L Chat, but by now, the fandom has spread out, to the aforementioned Facebook and Google+ groups, a Tumblr blog, a message board and even a website dedicated to the fandom. This upcoming weekend, a group of fans even makes the transition from the virtual to the real world at an international fan meeting in Berlin. So that’s what’s happened since I wrote the first article about Anni & Jasmin for the English section of this blog a year ago. I hope that a year from now, I will be back to write about them again: how they managed to make their relationship work and are still going strong. It’d be nice to have them on our TV (and/or computer) screens for a little longer. A new lesbian couple on German TV? Meet Anni & Jasmin from “Gute Zeiten, schlechte Zeiten” | Rosalie & Co.
Gute Zeiten, schlechte Zeiten (GZSZ): Anni & Jasmin – FAQ | Rosalie & Co.
Hi Oz, I’ve mentioned the website in the text, but thanks for adding the link, too.